One thing I really like about the local villages is that many of them come in pairs: Two neighbouring villages share one part of their name, but have different pre- or suffixes. A well-known and widespread instance of this are Great/Little-pairs, such as Great and Little Shelford immediately south of Cambridge. I would expect that Upper/Lower pairs are also found more than once, although I haven’t seen such a combination in East Anglia, and can at the moment only think of the Slaughters in the Cotswolds (to which unfortunately I haven’t been yet). 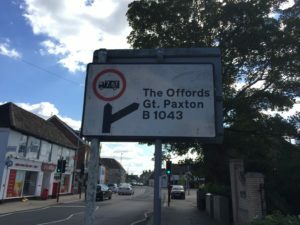 A particular charming aspect is the treatment of village pairs on road signs: They will guide you to the Shelfords, the Mordens, the Offords, etc. Back to the village pairs themselves though. My favourites are those where the pre- or suffix are quite unusual. 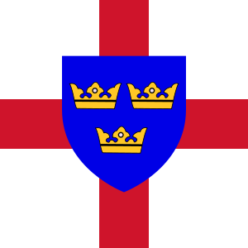 The aforementioned Mordens, for instance, are composed not of Little and Great, but of Guilden and Steeple Morden! Individually they are not unique – there is a Guilden Sutton and a couple of other Steeple-villages, but the particular combination seems to be one of a kind. Swaffham Bulbeck and Swaffham Prior, through which I came on my trip to Bury St Edmunds, also deserve a mention. 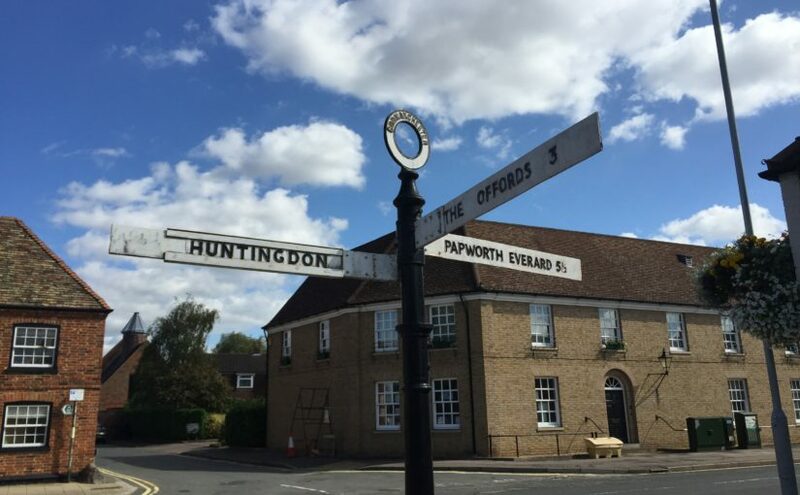 Even better, in my opinion, are the Offords near Huntingdon, which I came across while randomly looking at a map. They consist of the mysterious sounding Offord Cluny and Offord D’Arcy, and once I had encountered them I immediately decided that I should pay them a visit; a plan I implemented a couple of weeks ago. 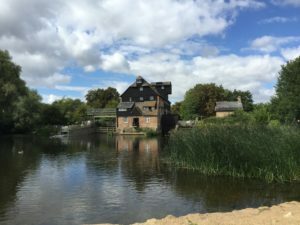 Godmanchester is worth mentioning given the topic of interesting names, since it used to have a rather unintuitive pronunciation: It was traditionally known as GUM-ster, which clearly beats Worcester in terms of unexpectedness. Apart from the signs, I have not that much to report about the Offords. They are right next to the East Coast Main Line, which is cool if you like trains. The area is quite hilly by Cambridgeshire-standards, on that day it was also very windy, and the road also didn’t have a cycle path, so the overall situation was more challenging than anticipated. It was good to have seen the Offords nevertheless. After the trip, I tried to find out more about how exactly the names emerged (relying mostly on Wikipedia: 1, 2, 3). 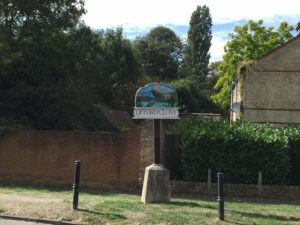 In the Domesday book, there are two entries for the Offords (with different owners), however both are about Opeforde / Upeforde, so it is not quite clear whether there was already a distinction between the two villages or whether they were regarded as one. The one entry gives the monks of Cluny Abbey in France as the owners though, which explains the one name. The name Offord Darcy is apparently documented for the first time in 1279, but nothing seems to be known on it’s origin. I also looked into whether there is any literature on the phenomenon of village pairs more generally. The obvious place to look was the journal of the English Place-Name Society, where I indeed found an article called “Do –ingas place-names occur in pairs?” by Susan Laflin. I even found a PDF of it on the homepage of the author, however the pairs that are discussed there have a different naming-style from the ones I wrote about here. 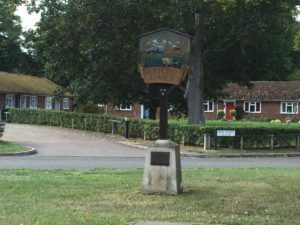 Let me close by mentioning some other place-name facts: In Hertfordshire there is a village called Nasty, and not far from there, in neighbouring Essex, is a village called Ugley. 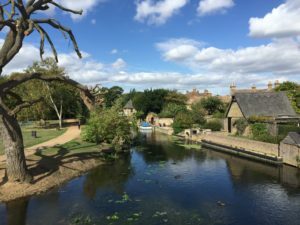 And did you know that there is another place called Cambridge (on another River Cam) in Gloucestershire, which is pronounced differently from the more well-known Cambridge? This is a very nice blog, thank you!